From 1998 to 2018 THPC contributed over US$608 million to the Lao government's finances through dividends, royalties, profit taxes and equity return. From 1998-2002 the company was the country's chef earner of foreign exchange and revenues during these years were of great importance in helping Laos weather the Asian financial crisis. THPC has also augmented its contributions to local communities during the extension phase. 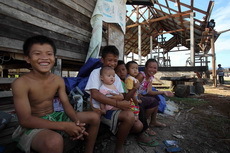 As well as improving living conditions for over 6,000 people in resettlement villages through better housing, health and social care, water and sanitation, the project also increases the options available to people for their future through enhanced education, communications and trade and power infrastructure. The same is true in the downstream area where new housing and facilities are being extended to 23 villages at the request of the communities. Cash compensation, village credit systems and livelihoods programmes that offer technical advice, tools and inputs are also included in resettlement and relocation packages. Meanwhile construction or extension and renovation of six irrigation schemes has boosted the area's agricultural potential. 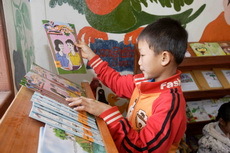 From 2007-17 THPC invested more than US$110 million in social and environmental programs in the project area. During the construction periods THPC provided valuable income and training opportunities to thousands of Lao workers. At its peak, the Expansion Project employed over 2,500 people, about 65% of whom were Lao, with the majority coming from the two host provinces. Wages paid to these workers provides significant direct local economic benefits. Since the beginning of operations, income taxes from THPC staff have been collected and paid to local district authorities, making an important contribution to the development of public services in the project area. THPC continues to offer quality employment opportunities during the operational life of the plant, training Lao staff in a diverse array of skills including engineering, health and social work, agricultural extension, administration and environmental engineering. Around 99% of THPC staff are Lao nationals. Although 95% of THPC's power is exported to Thailand (greatly contributing to the efficiency of the Thai national grid), the electricity sold to EDL has great significance to Laos. 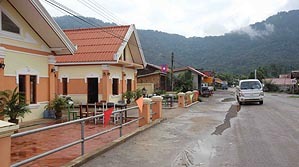 Over the first fifteen years of the project, THPC electricity has helped transform the economy in Bolikhamxay and Khammouane, enabling small and medium businesses to flourish, where few could do before, and bringing electrification to thousands of people who were previously in the dark every evening. The 60-MW Nam Gnouang power station built by the Expansion Project supplies electricity exclusively to EDL and is connected to a new regional substation and transmission line system. This enables improved supply to Bolikhamxay and Khammouane, significantly improving the reliability of supply to the two provinces, allowing expansion of generating connections in the main towns, and supporting rural electrification. Both Theun-Hinboun projects have contributed major improvements to road networks in the area, providing upgrades to National Roads 8 and 1D, and replacing ferry crossings with international-standard bridges that allow year-round road access. 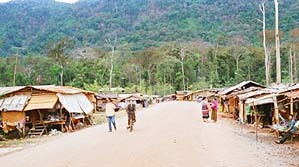 In addition, all-weather roads to and around resettlement and relocation villages enable many local people to reach markets and public services for the first time. THPC is currently working with the Khammouane provincial government to find a long-term solution to the need for an upgraded bridge over the Nam Hai in Khounkham district. THPC works with local and central authorities to protect the watershed around the project rivers, and also encourages and educates local people to respect wildlife and the environment. A Catchment Biodiversity Development and Protection Plan is being implemented together with wildlife conservation groups and national authorities. The plan has created a provincial protected area around the Nam Gnouang reservoir and is regenerating degraded forests and old upland agricultural areas in the catchment. The company has installed a water treatment system and a solid waste disposal facility in Kheunkham, the first examples of such services in the area. These facilities are used both by the company and the local villages and administration, while landfill sites and recycling schemes have also been established in various resettlement and relocation villages. Hydropower has various economic and environmental advantages over other currently vialble generating technologies. Large parts of Laos are still littered with lethal unexploded ordnance (UXO), mainly left from the Indochina war of the 1960-70s. The area around the Theun-Hinboun project has high concentrations of bombs and anti-personnel devices, posing a severe threat to people dependent on the land for a living. THPC has cleared over 136 hectares of land of UXO as well as conducting spot removal of discovered devices and community education on the dangers of ordnance.